developers saw double-digit rises in sales revenue and floor space sold. Developers are hungry for more land. The boom has triggered a step-up in policies to cool down the heat. 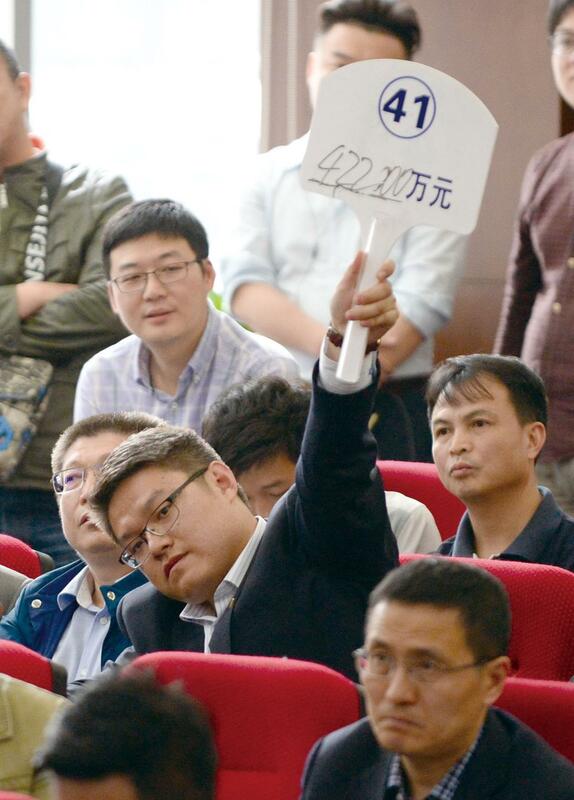 Between the end of April and May 9, 12 cities where prices rose sharply were publicly warned by China’s Ministry of Housing and Urban-Rural Development to put a halt to speculative investment on housing. Ten days later, the ministry issued a statement with a task list for local governments, which included making housing development plans, adjusting land use for different types of housing, controlling debts of developers and buyers as well as cracking down on irregularities in marketing gimmicks. In contrast with the escalation of both the market and regulatory policies, sources of domestic and overseas capital are all but frozen. The high debt ratio of developers has become an issue of wide concern, as the real estate sector involves huge amounts of capital and land and thus has direct impact on the financial stability of the national economy. cThe future property market might not be as rosy as it looks now, particularly for smaller players. 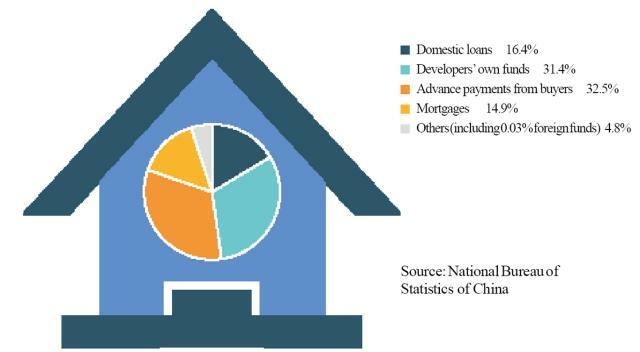 The actual paid investment on developers’ accounts rose 5.1 percent in the first five months of the year, the lowest since early 2016, largely due to a decline in domestic loans and household mortgages, found data from China’s National Bureau of Statistics. financial risks is the priority of the national economic policy agenda, lines of credit to the real estate market have tightened. Some developers were used to borrowing new loans to pay back old ones. This is no longer possible,” Gu Yunchang, deputy director of the expert panel on housing policies at the housing ministry, told NewsChina. In January, the former China Banking Regulatory Commission, which is now part of the new China Banking and Insurance Regulatory Commission (CBIRC), launched a sweeping crackdown on irregularities in the banking sector. The practice of disguising bank credits, either on or off the balance sheets, to ineligible developers and households was put on the blacklist. Big developers then shifted to overseas markets for financing. 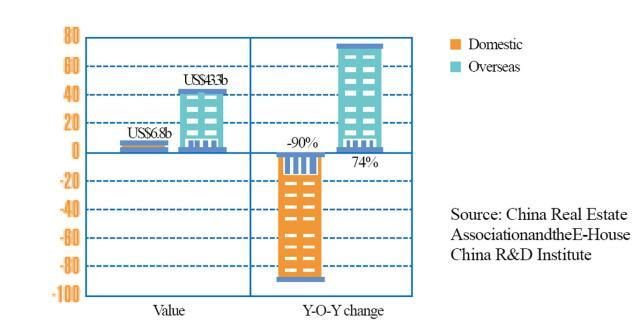 The National Development and Reform Commission (NDRC), China’s main economic planning body, recorded bond issuance registrations by several major developers, such as Vanke, Sunac China, Hua Yuan Real Estate Group, Jinke Property Group and Beijing Capital Land. Gu said the interest rates for overseas financing typically stood about six percent in the past and while it has risen to more than eight percent now, it is still much lower than the 15 to 20 percent in the domestic market. In a new policy which is still under consideration, real estate enterprises will not be allowed to borrow on the overseas market, noted Wang Chunying, spokesperson for China’s State Administration of Foreign Exchange (SAFE) at a press conference in Beijing on April 19. On May 11, the NDRC and China’s Ministry of Finance issued a decree which requires Chinese enterprises and local governments to spend money raised overseas on innovation, green projects, emerging sectors with strategic importance, high-end equipment manufacturing, the Belt and Road Initiative and international production cooperation. buyers. Gu said that in cities where restrictions on purchasing and selling, as well as on prices and mortgages have been adopted, banks are reviewing mortgage applications more carefully and to stricter standards. Developers must therefore wait longer before mortgages are approved. As credit and mortgages are the two biggest capital sources for developers, the situation makes it difficult for developers to maintain enough cash flow for their operations. Indeed, the debt ratio of developers has attracted a lot of attention from analysts since the central government made clear that “housing is for living, not for speculating” at the end of 2016. According to Wind, a Chinese financial data and software service provider, by the end of the first quarter of 2018, 136 developers listed on China’s A-share market (stocks listed in the Chinese mainland and denominated in Chinese yuan) had exceeded US$ one trillion and their debt-to-asset ratio had reached 79 percent, the highest since 2005. They face very high pressure to repay debts. Securities in Shanghai show that nearly US$200 billion in bonds issued by developers are set to mature in 2018, and many more will mature in the next two years. increase in 2017 because their spending on land acquisitions rose by 50 percent over that of 2016, and their investment grew by 10 percent,” Gu said. He added that the tightened housing policy has resulted in shrinking borrowing and revenues, which has pushed developers’ debt ratios further up. Exchange in April and May. These developers claimed in their responses that they have no problems in their financial arrangements. Speculation that even Vanke, one of China’s largest developers, was heavily indebted shocked the market. The company said in its statement for the first quarter of 2018 that the ratio of interest-bearing debts to total assets stood at no more than 16 percent, and it had strong cash assets at hand. Securities analysts came out in support of Vanke, saying that the speculation was a misunderstanding of accounting standards. However, all this has shown how sensitive the market is toward the default risks of real estate developers. Analysts are not so worried about big developers. But they see medium and small developers as much more disadvantaged in coping with the tightened financing policies, the longer revenue collection time and increasing amounts of debt repayment. The gap between large and small players in the real estate market is even bigger than before. The China Real Estate Association in Beijing and the E-House China R&D Institute in Shanghai released their annual top 100 list for 2017 in Shenzhen on May 25. The survey covers 124 developers listed on China’s Shanghai and Shenzhen stock exchanges, 81 in Hong Kong and two on overseas stock markets. The top 15 developers held more than half the total assets of all listed developers. The number was 18 in 2016, showing “growing concentration of the market,” the report said. The same landscape can be seen in the broader picture. The top 500 list disclosed by the two institutions in March in Beijing showed that a number of smaller developers on the list reported decreases in sales revenue in 2017. The real estate market is entering an era “in which the strong will get stronger,” it concluded. It is hard to say how the collapse of many smaller developers, if that happens, would hit the market and the whole economy. But it seems that no other sector has attracted so much attention, no matter if it is in a period of boom or bust. When the market is strong, there is criticism against looming bubbles, the increasing cost of living and that it is squeezing capital out of manufacturing. In a downturn, concerns prevail over whether it would drag overall economic growth down and trigger financial disorder. Financial stability is at stake in either scenario.